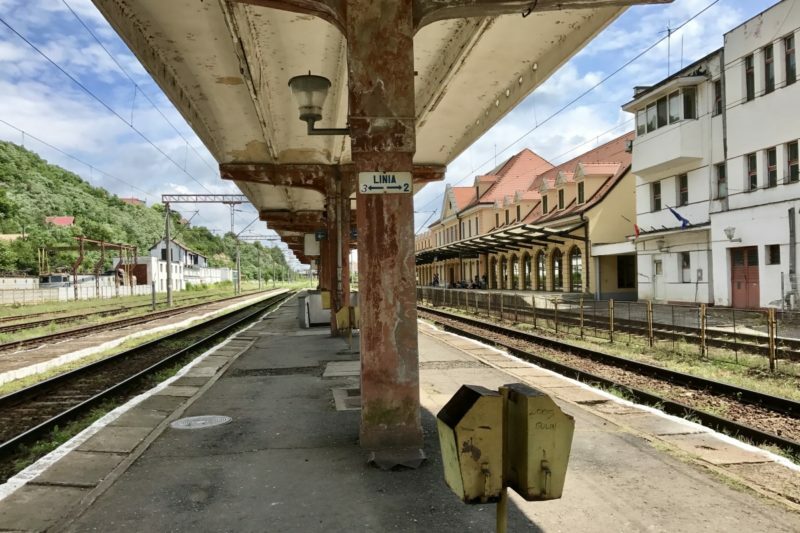 As we made our way to Romania, I was thinking – I had 14 hours on the train from Prague, so plenty of time to think! – that I really don’t know anything about Romania. Oh, I knew about Transylvania, and Dracula, but I’ve not even read Bram Stoker’s book, so I’m definitely no expert. At this stage of our trip, we were starting to get into the places I had not researched. 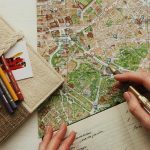 We were planning only a few days ahead, and may as well have been throwing darts at a map to pick our destinations. 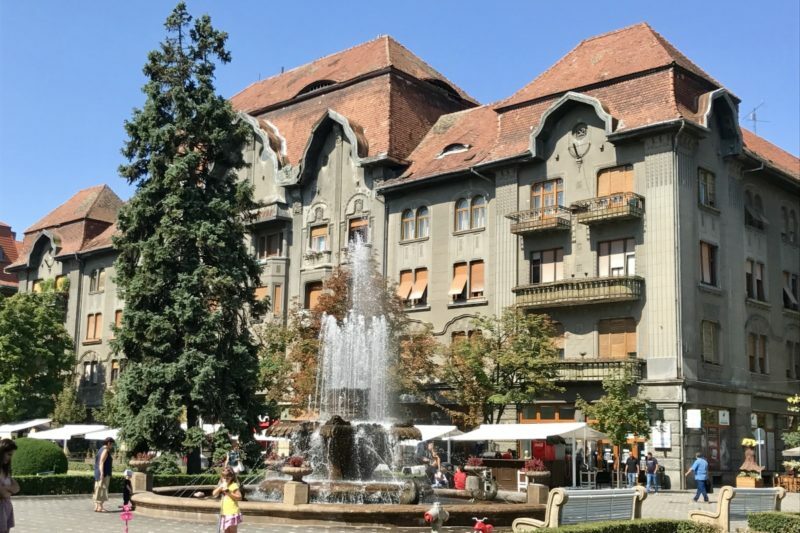 So our first stop in Romania was Timișoara. Timișoara (pronounced Tim-i-swar) is the third largest city in Romania with a population around 300,000. It is in the north of the country – which is essentially why we ended up there. It just seemed like a good place to stop as we headed south from Prague. We arrived just as the sun was going down and had a thirty minute walk to our AirBnB. One of the first things we noticed is that almost everything is under construction in Timișoara. The train station was being completely rebuilt, and we had to walk over, through, and around road works on our walk. We were to find that this was a common theme for our whole stay. The next thing we noticed is how cheap Romania is! We got into our apartment, and having not eaten much all day, we walked a couple of minutes back to a supermarket we saw open to grab some supplies. A quick search had suggested that while the water is safe to drink, if you haven’t been in Eastern Europe before, it’s probably best to start with bottled water until you build up some immunity to some of the bacteria. 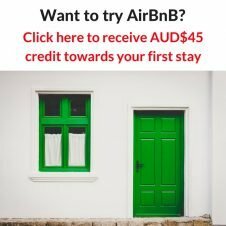 We got 5L for about $0.55AUD. Yes, that’s about 11cents per litre. We had five nights and four days in Timișoara, and each day it was between 37 and 39 degrees Celcius. This meant that our routine – which has stuck for a lot of the trip – became doing most of our exploring in the morning for a few hours. Once it got too hot in early afternoon, we would go back to where we were staying and the aircondtioner. As it cooled down in the evening, we would usually head out again. A quick internet search before we went out on the first morning shed a lot of light on all of the renovation and building work going on. 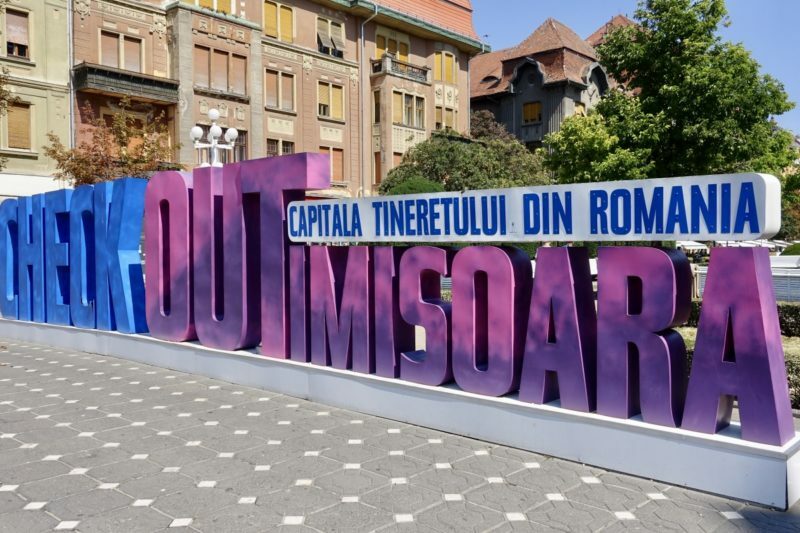 Timișoara has been selected as the European Capital of Culture for 2021, so I am assuming that the city is already beginning to prepare. 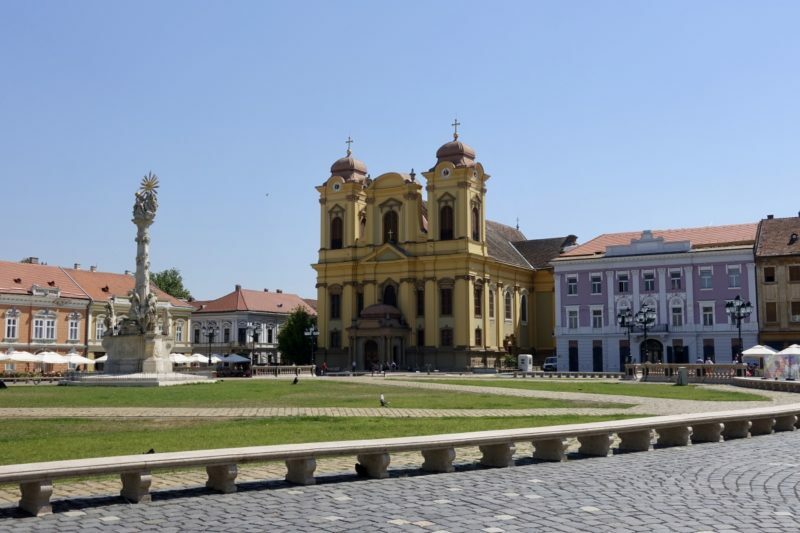 One of the squares in Timisoara with St George’s Cathedral in the background. 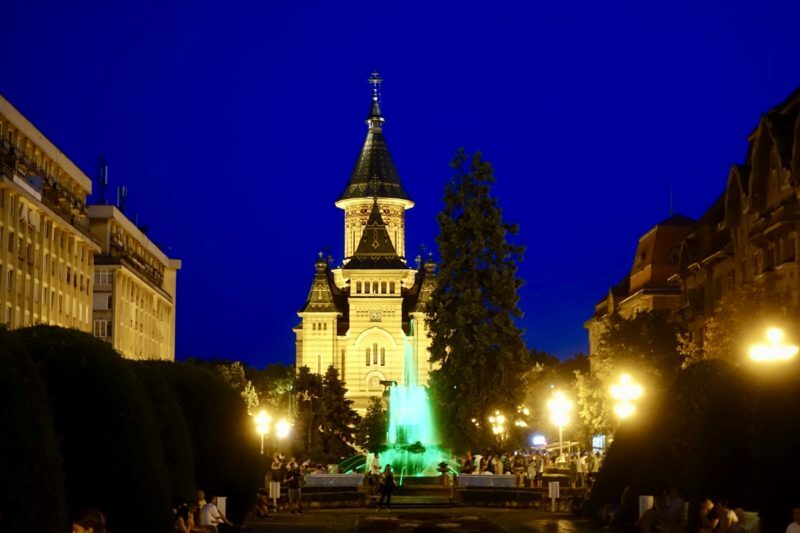 If you are visiting Timișoara and expecting to have lots of things to do you will be disappointed. There really isn’t a whole lot here at the moment. Having said that, we loved the feel of the city. 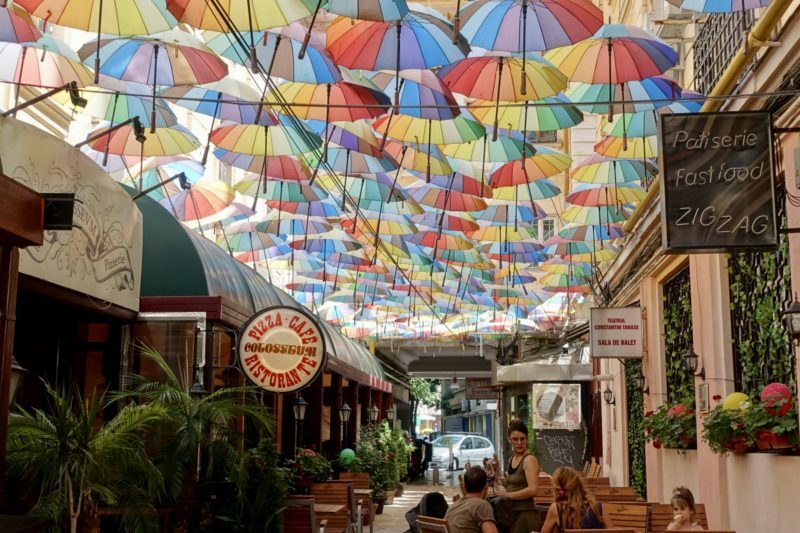 It has a huge culture of outdoor cafes and restaurants, with tables and umbrellas lining every square and many streets. Even with such high temperatures, there were lots of people out in the mornings doing just what we were doing. Grabbing a coffee and soaking up the atmosphere. 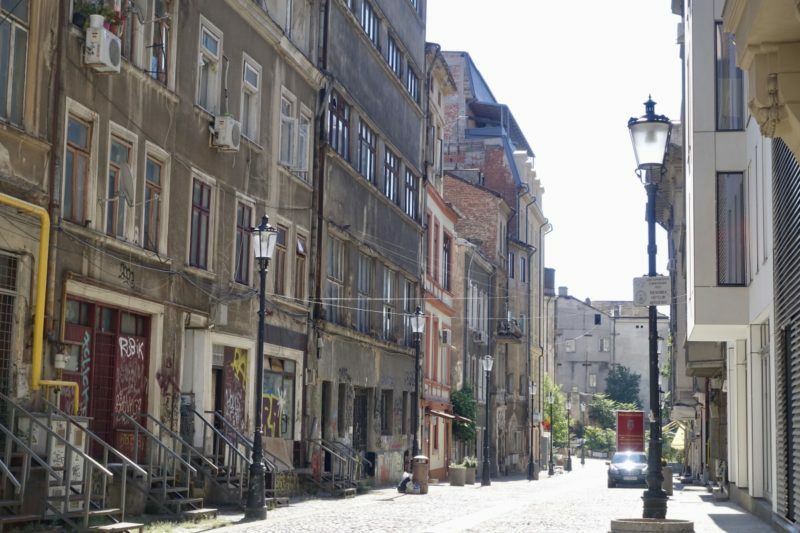 There are some really nice buildings – in all sorts of conditions – in Timișoara. 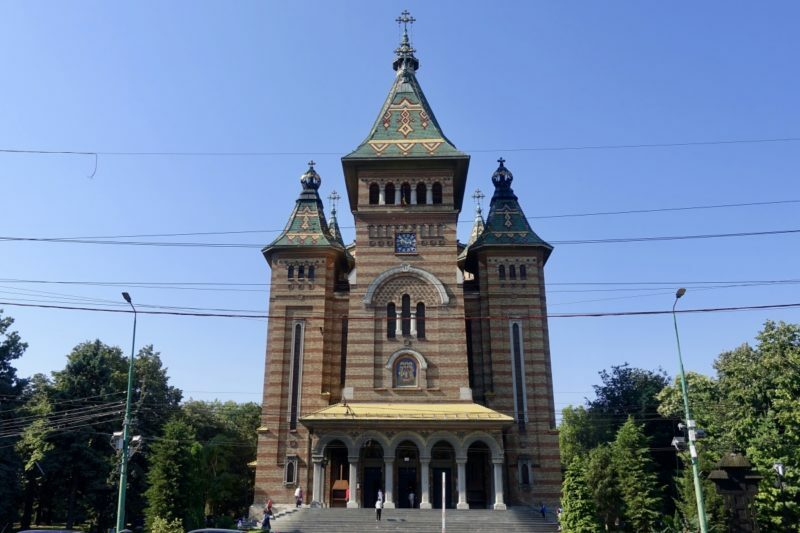 The first building you can’t help but notice is the Timișoara Orthodox Cathedral. We have visited dozens of churches, cathedrals and other places of worship on this trip, but this has been the most memorable. Firstly the building is just lovely, but it was once we went inside that we were really stunned. This was our first Orthodox Church, and to see it all gold, and lit up with candles was so beautiful. But each time we went in – we visited three times – there was singing and chanting and it was mesmerising. I am not religious, but it sent a bit of a shiver down my spine. The reason we went back three times was because I wanted to photograph the church, but felt it was too disrespectful while services were on and people were worshipping. I did not do it. 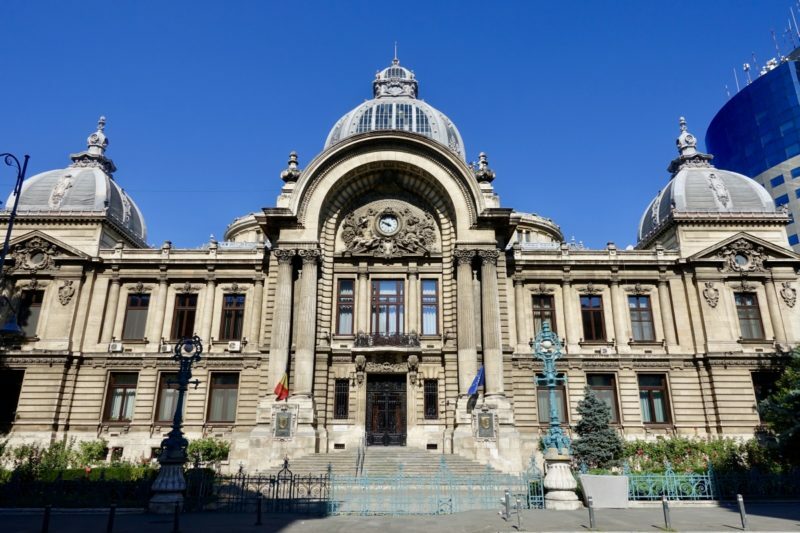 At the other end of Piața Victoriei (Victory Square) is the Romanian National Opera House, another beautiful building. 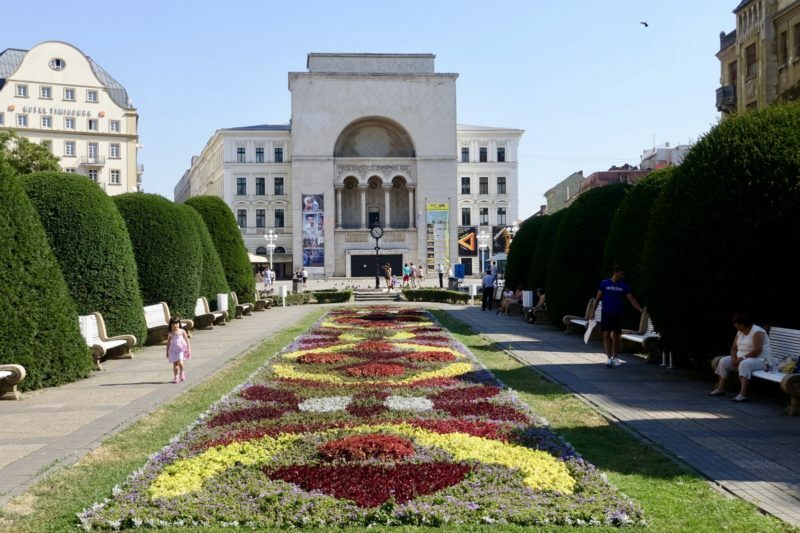 Along with other buildings on both sides of the square, this is a lovely area with gardens and fountains. It was most beautiful when the sun went down, as all the buildings are lit up. During our time visiting, as the sun went down, the people came out into the square, with kids and pets. We loved eating dinner in one of the restaurants here to enjoy the atmosphere. On top of the building next to the opera house is a rooftop bar. It apparently has great views over the city, but we didn’t get a chance to see because bookings were required. I am not sure if that was for every night, but it did happen to be Saturday when we wanted to go. We had to be content with listening to the live band from below. On one of the days we visited the Museum of Art. Entry was 10Lei (€2.18) and we were looking forward to some air-conditioning as we browsed through the artwork. We were disappointed. While there were some small portable air conditioners working, the heat was still quite oppressive. In many areas there was no airflow, and it was unpleasant. I’ve said before I am not an art lover, so I’m not really a good judge, but there was an interesting special display of huge wax sculptures. No photos were allowed, and we were closely watched, so I couldn’t even sneak one. 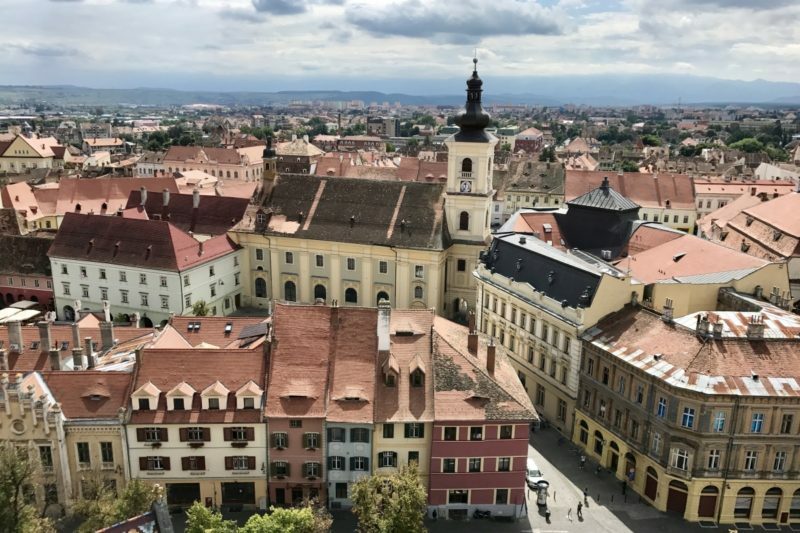 Another agonisingly long train trip took us to our next stop of Sighișoara (pronounced Sig-i-swar) – the birthplace of Vlad the Impaler. 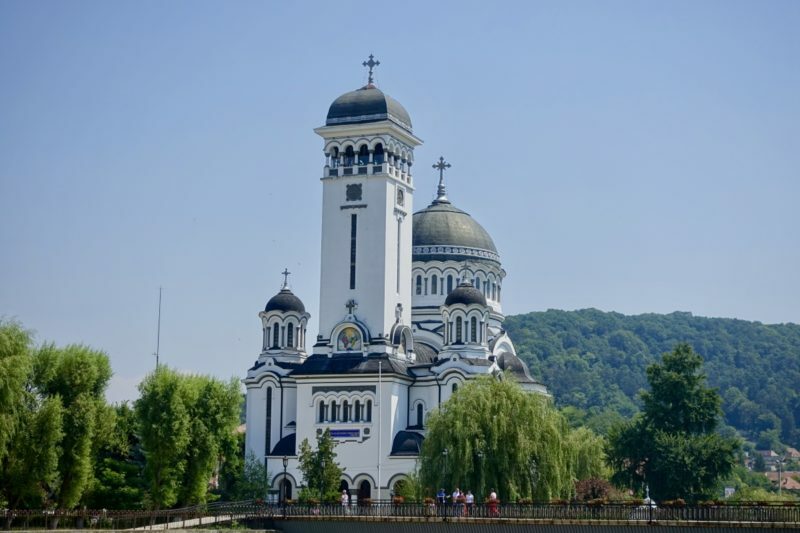 Located in the centre of Romania, it has a population of around 30,000, and we were captivated from the moment we arrived. That possibly had something to do with where we stayed. We were at the Doubletree by Hilton, which is perfectly located right below the Citadel, and we had stunning views of the churches and castle on one side, and the Orthodox Cathedral on the other. 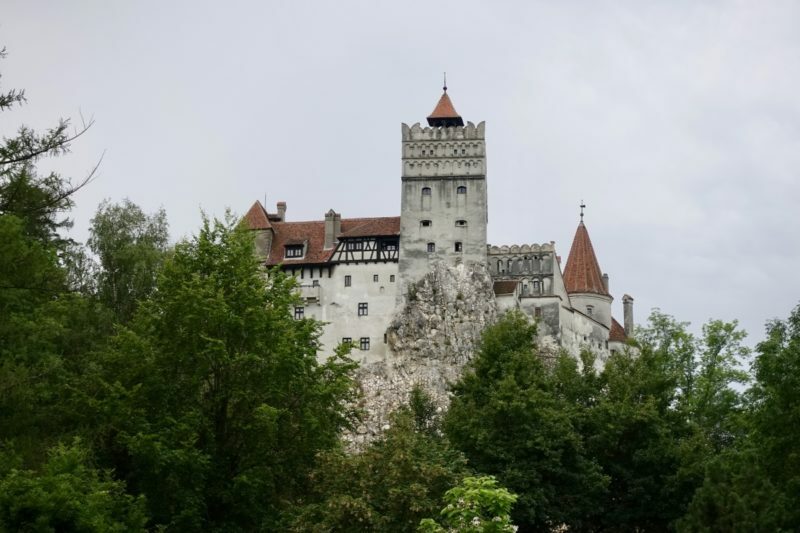 The main thing we wanted to do while we were here was visit Bran Castle. We organised this with Emanuel from Your Guide in Transylvania. Emanuel is a local, having grown up in Sighișoara, and he is absolutely passionate about showing people around his country. He has a multitude of tours available, or he can put something together just for you. We did his standard full day tour to Bran Castle. 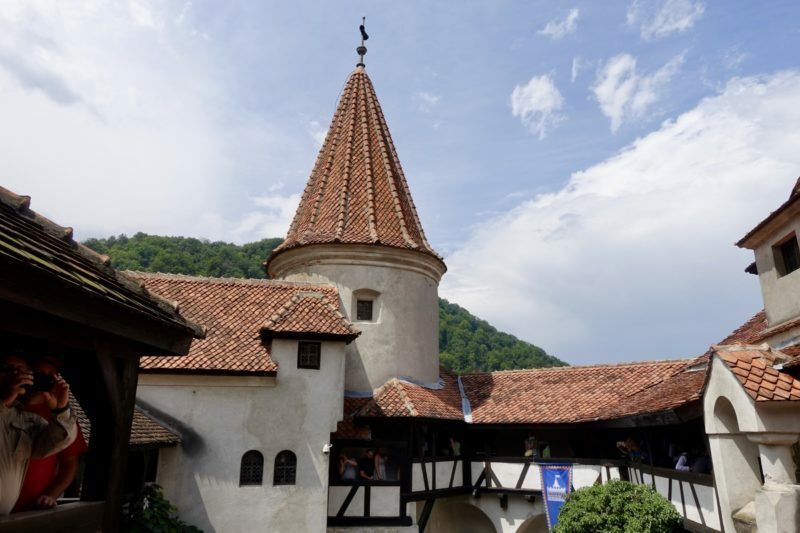 It’s a two hour drive to Bran Castle, and we got so much history of Romania and Transylvania on the way there, and on the way back we had some fantastic conversations about life in general in Romania. Emanuel then went above and beyond! 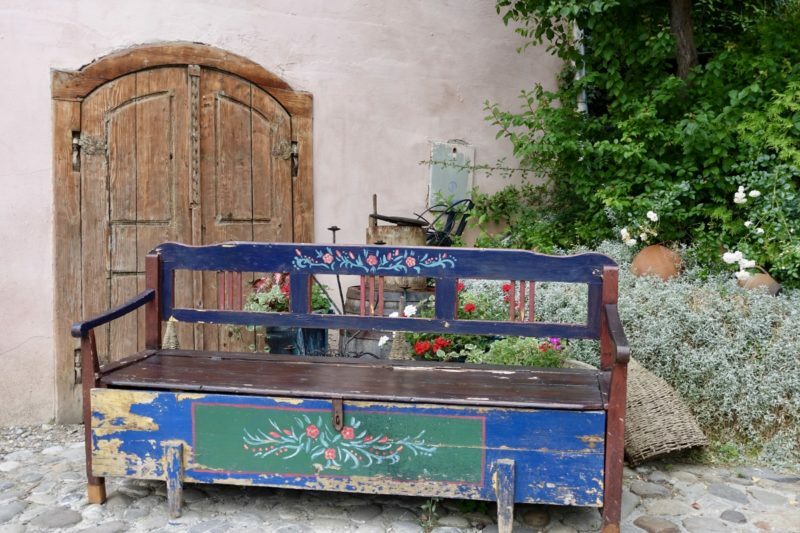 He had to take his car to the town of Sibiu the following day, and offered to take us along. Bran Castle itself is just a castle, a cute castle, but perhaps a little too touristy for my liking. It’s the stories that go along with it that make it interesting. 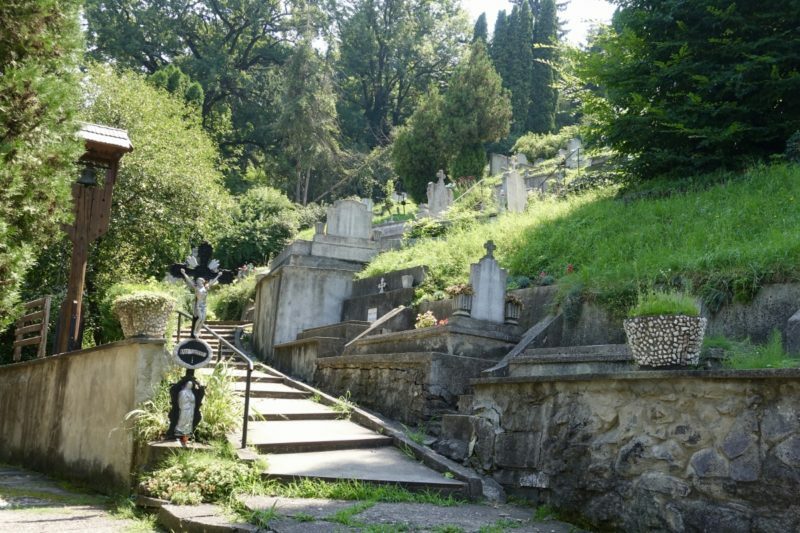 Vlad the Impaler, who inspired the Dracula character, spent very little time here. It was more his father’s castle. Vlad the Impaler though was, for Transylvania, a great figure in history. He was able to scare off the Ottoman’s with just his reputation – oh, and a few impaled Ottoman soldiers along the roadway! I will always remember our visit to Sibiu for the houses that have eyes. In the medieval town centre, many of the buildings have attic windows in the roof that look like eyes. It really is like the buildings are watching. 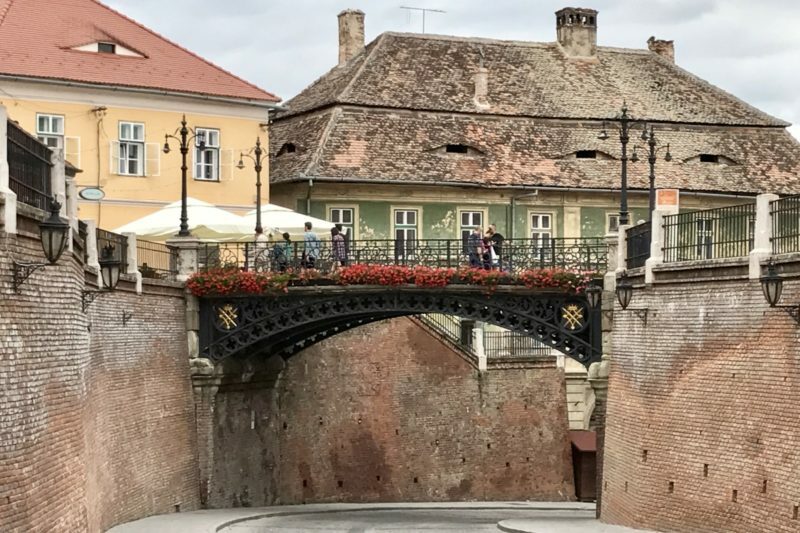 We enjoyed just strolling around the streets and looking at some of the unique features, like the Bridge of Lies. 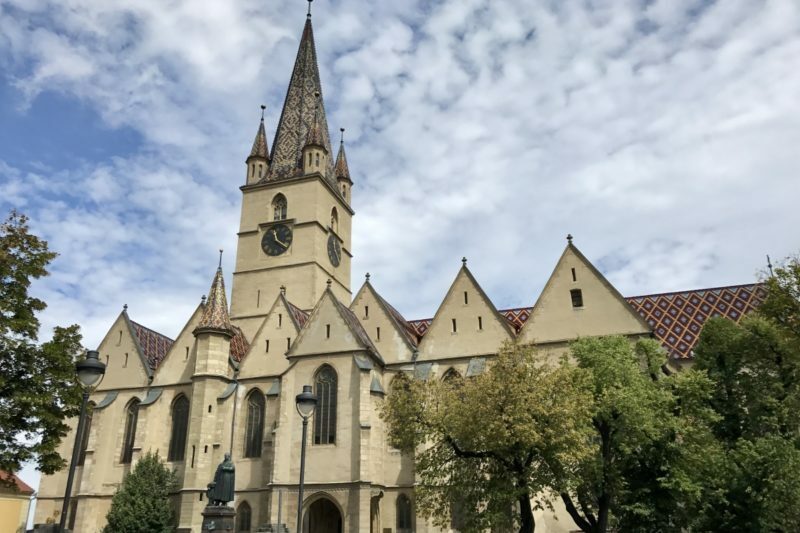 The Lutheran Cathedral of Saint Mary is the most visited church in town. It has a tower that for a small fee gives great views over the town. Almost as interesting is seeing the inner workings of a clocktower. It is not recommended that you visit on either the hour or half hour, as the ringing bells can be quite loud if you are in the tower. 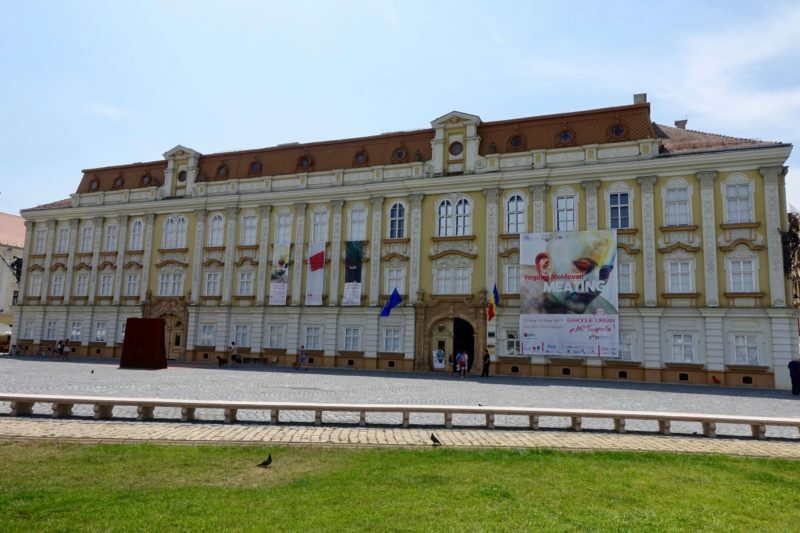 There was still time for a visit to the Sibiu History Museum. This was one of the nicer little museums we had seen recently, with dioramas set up to display quite a few of the objects rather than just have them sitting on shelves. There was also and armoury with weapons, and some Roman artefacts too. An hour will be plenty of time to spend here. Photos were not allowed in the museum, but I loved the way they had some of the displays done as books, so I asked nicely and they let me take one. 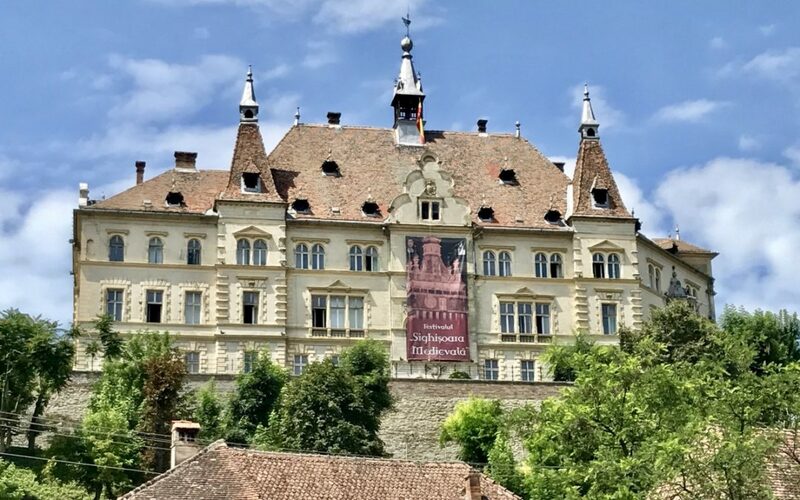 Our final day was spent – finally – exploring Sighișoara and the Citadel. The old streets below the citadel contain colourful buildings, just like all my favourite towns! We walked around just admiring them, before heading up the hill to the Citadel. 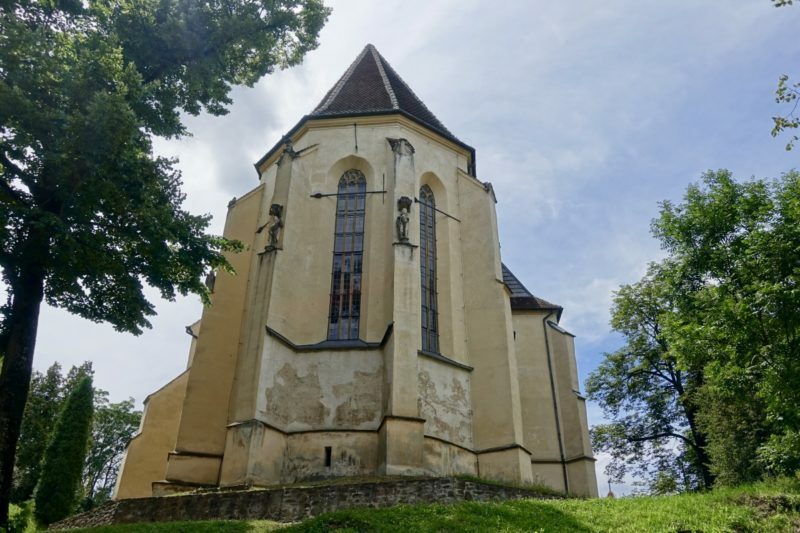 While the castle is not able to be visited as it is used now for government buildings, there are churches and other buildings – including the house Vlad the Impaler was born in – that can be visited. We also had a little poke around in the old cemetery. Surely that just has to be done in the birthplace of Dracula! 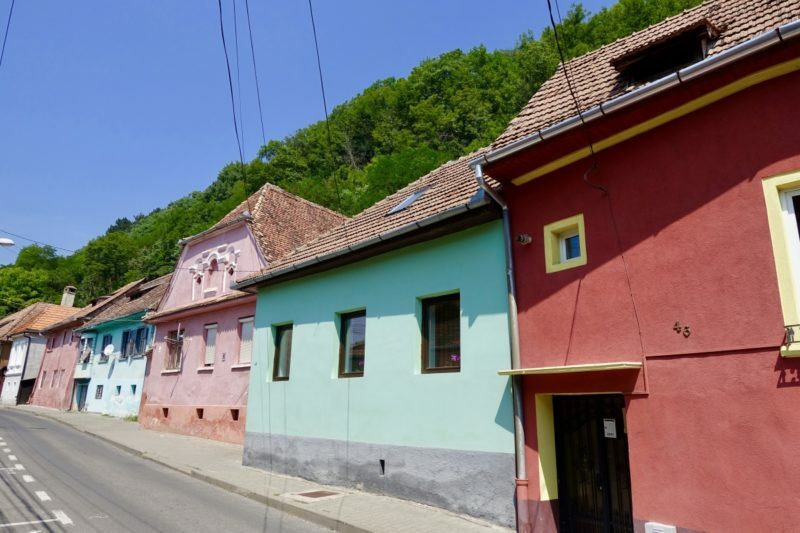 Sighisoara have plenty of colourful streets! The Citadel is all cobbled streets and touristy places. The day we were leaving Sighișoara the annual Medieval Festival was starting, so stages and other infrastructure was being set up for live music and theatre. I could not think of a better location to enjoy this sort of festival, as the area is, well, just so medieval! 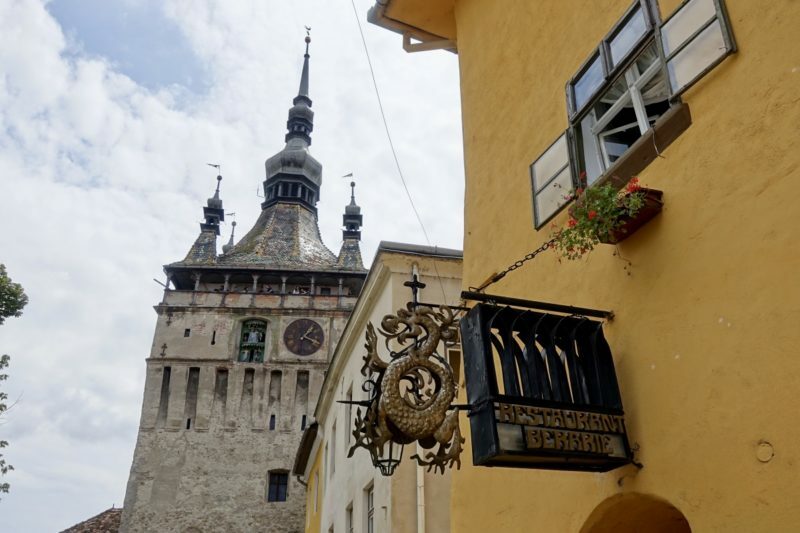 Vlad the Impaler’s birth house is now a restaurant. It is. possible to go inside to see the room he was born in. 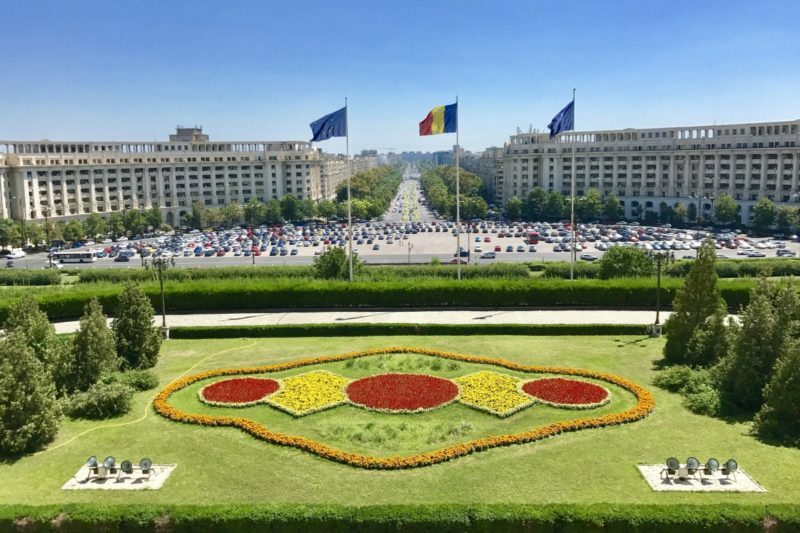 Long torturous train ride number three deposited us in Bucharest, Romania’s capital. 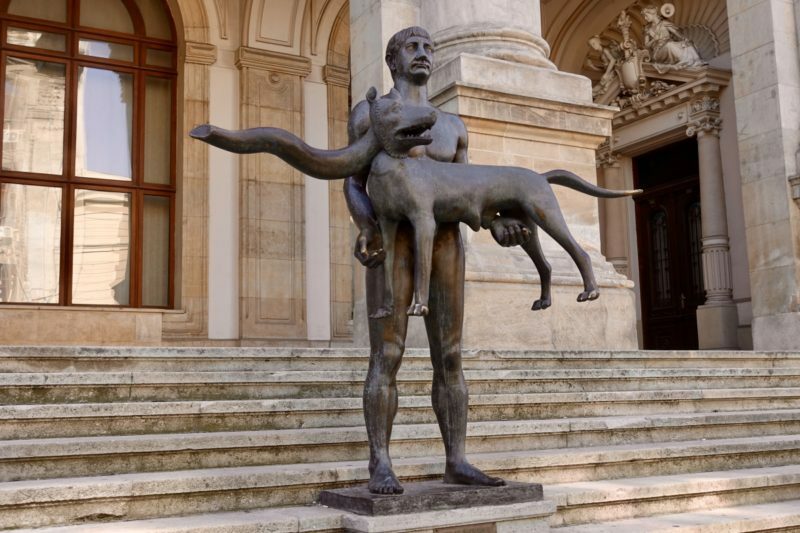 I am really struggling with how to describe Bucharest, I think I feel kind of “meh” about it. I didn’t dislike it, but I definitely didn’t love it either. It is still showing many signs of the communist era, and there is a lot to be done in terms of infrastructure. 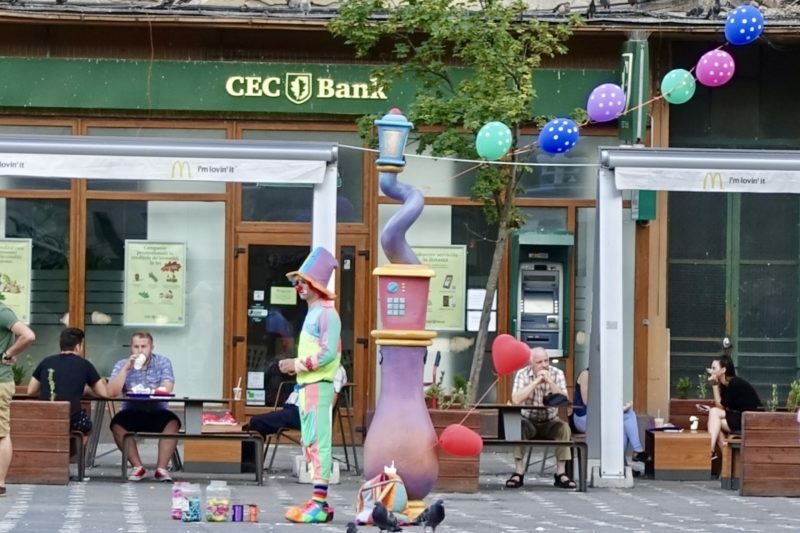 That being said, Bucharest is trying really hard at the moment to attract tourists and improve what they do. 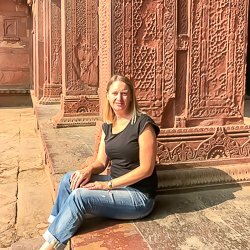 As we often do on arrival in a new city, we did the free walking tour on our first day. Our guide was a young Romanian doctor, and he was doing the tours to promote the country that he loves. He talked a lot about the history of Romania, and the problems that have been created with the fall of communism. There is still a lot of corruption in the government, with protests and demonstrations earlier this year reversing laws put in place only weeks earlier. It’s a bit complicated and I am no expert, so I won’t even try to explain exactly what happened. Our guide talked about a growing movement among the younger people to implement real change. 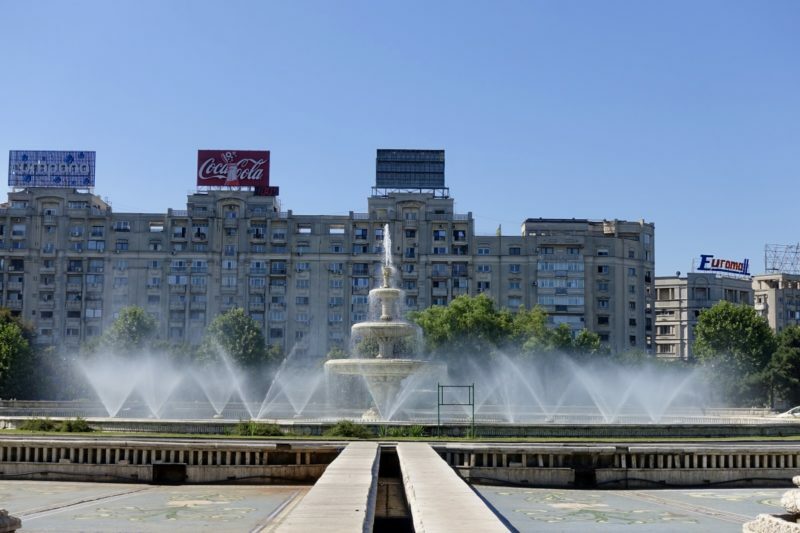 It was still really hot when we were in Bucharest, so we didn’t do too much exploring. When we went out it was more for meals. 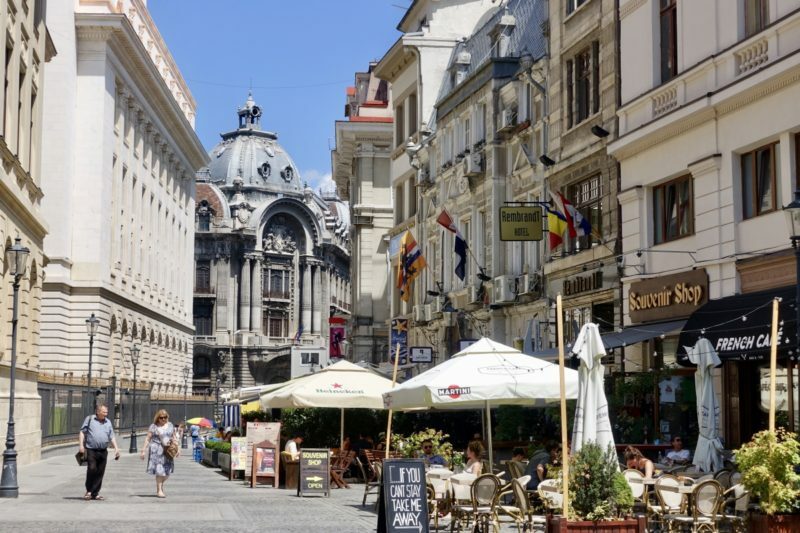 We walked miles to indulge Simon’s need to visit the Bucharest Hard Rosa Cafe, and on other occasions found little bars and cafes down backstreets to eat in. 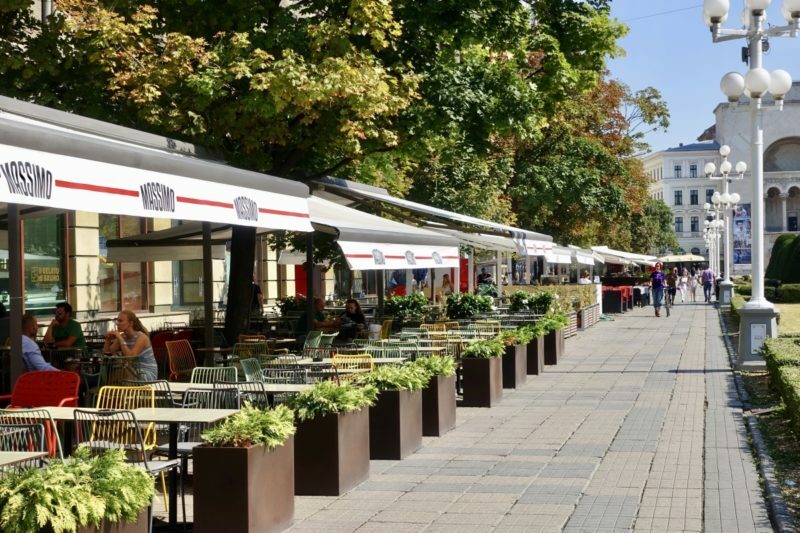 There is quite a decent cafe scene in the centre of town, with some good places to eat traditional Romanian food and many international foods too. To placate my inner book nerd, we also visited Cărturești Carusel, a pretty bookshop right in the main street. 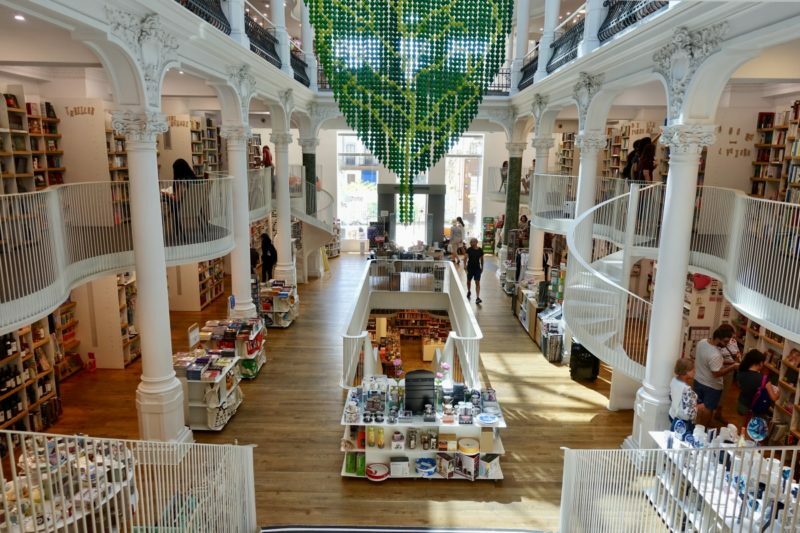 It’s all white and open, and has a large foreign books section. If I was allowing myself to buy books I could easily have picked up 3 or 4 in English that I want to read. 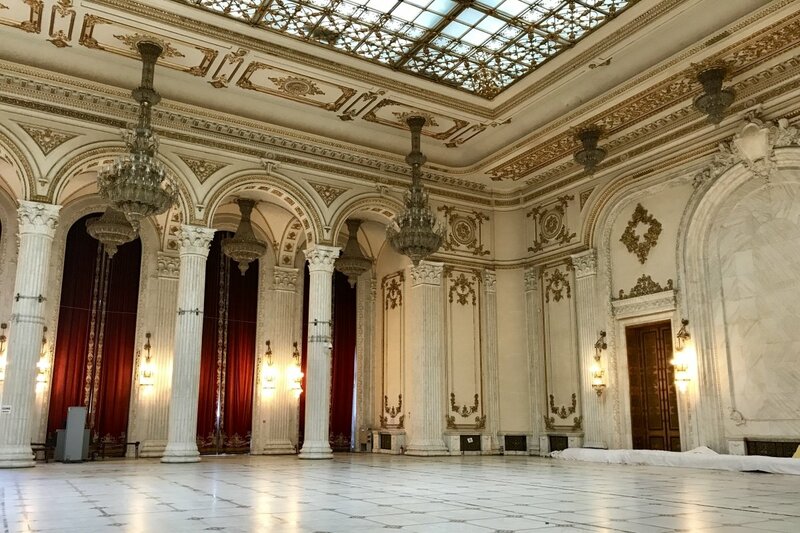 When in Bucharest, there is one building you cannot help but hear about – The Palace of the Parliament. This building is the second largest administrative building in the world, only smaller than the Pentagon. Looking at it, it is simply huge! It sits on the top of a hill and is, as intended, very imposing. 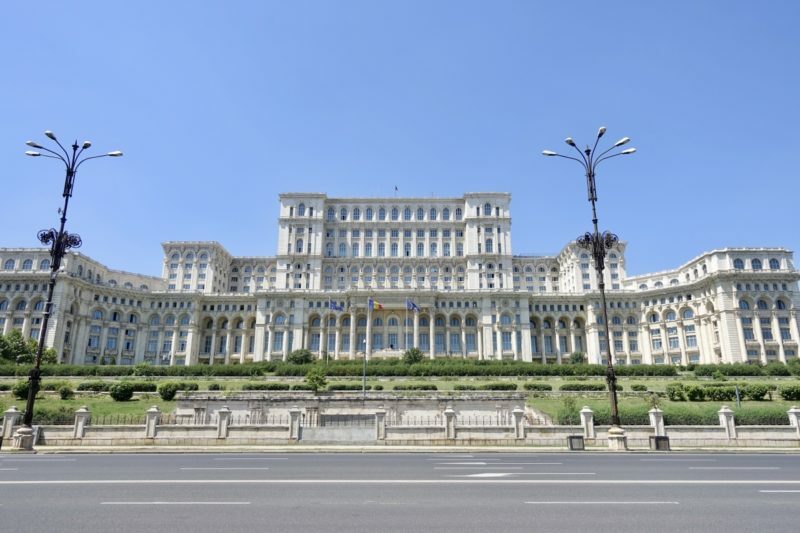 This was originally planned by the dictator Nicolae Ceausescu to house all government departments. He never saw it though, as it was not completed until 1997, eight years after he was executed. Now the building it only about 30% occupied, and the rest is hired out as convention space. Tours of the Palace of the Parliament need to be booked in advance. We got our hotel to call and reserve us some spots at our preferred time. In addition to the basic tour, there are other tours to see some of the other places below ground and the terrace on the roof. For some reason the day we were there only the basic tour was running, even though we would have liked to see the other areas. Now, having said all that, when we arrived and were waiting for our tour to begin, there were many people turning up without bookings. Our time was booked out, but they were able to reserve spots on the next tour. So while they say you must pre-book, turning up and taking a chance that there are spots available could also work. Also, taking photos with your phone is free, but if you want to use a camera there is a charge. The tour lasts about 90 minutes, and unfortunately that was about 60 minutes too long for me! All we were shown were empty reception rooms. 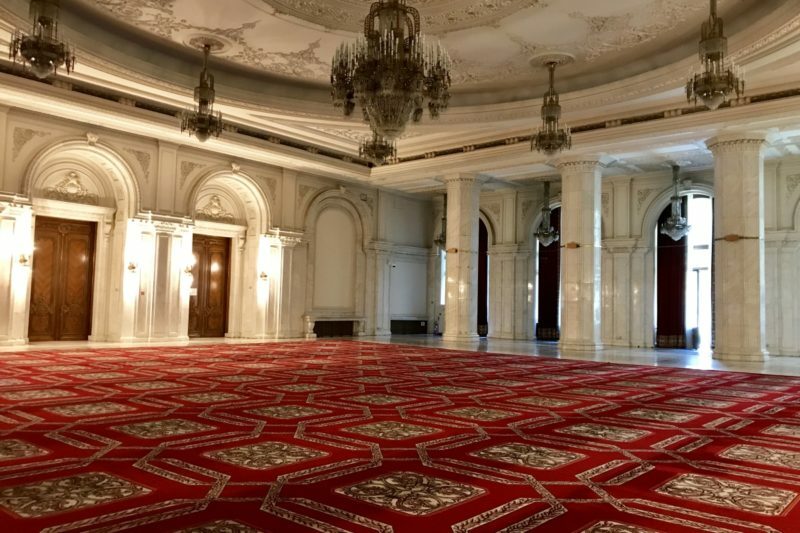 They are all massive, with huge carpets and chandeliers, and after a while begin to blend together. We did also get to go out onto the balcony which was famously first used by Michael Jackson when he called Bucharest “Budapest” in error. Now all this might have been good to see, had our guide had a bit of personality. Unfortunately he was just completely boring. 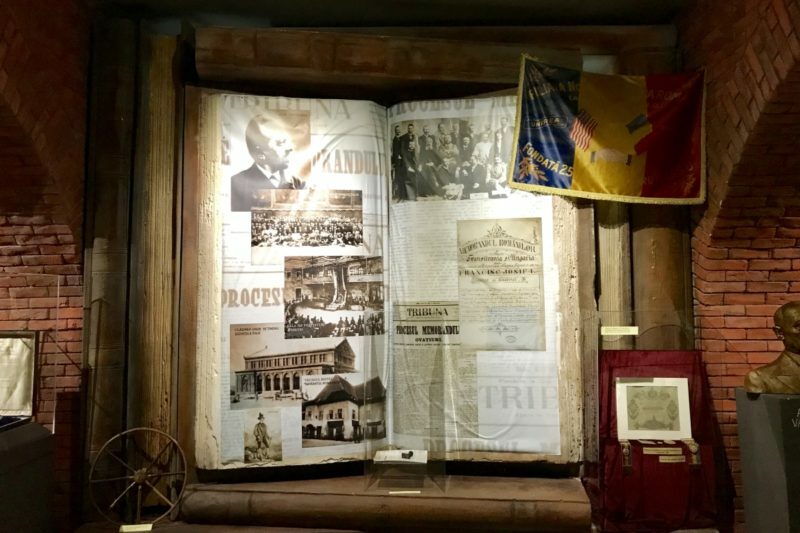 There were very few interesting stories, mostly we were simply given statistics on each room, and the place in Romania where each curtain, carpet or timber panel came from. The tour felt robotic, and there really was no connection with his audience. 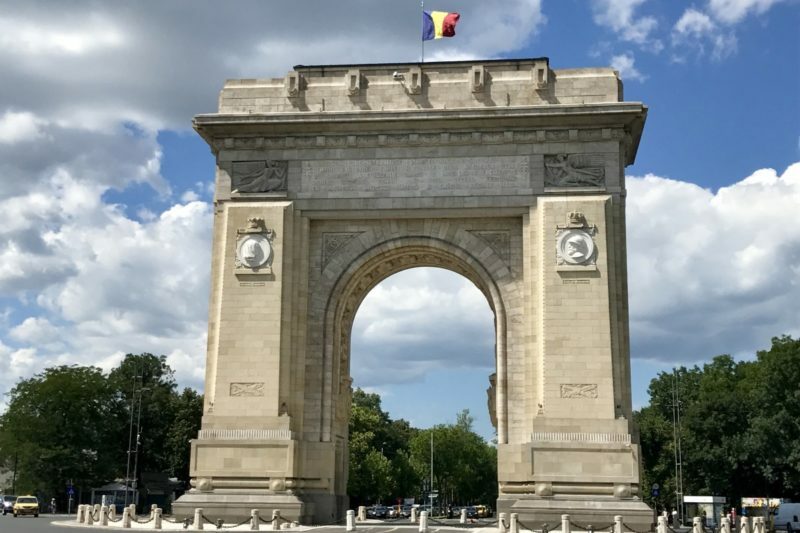 If we ever get back to Bucharest, I would possibly do this tour again and hope that a different guide would give a better tour. This carpet was so big it was made in pieces then brought here and assembled. It can’t be seen in the photo, but the joins are really obvious close up. 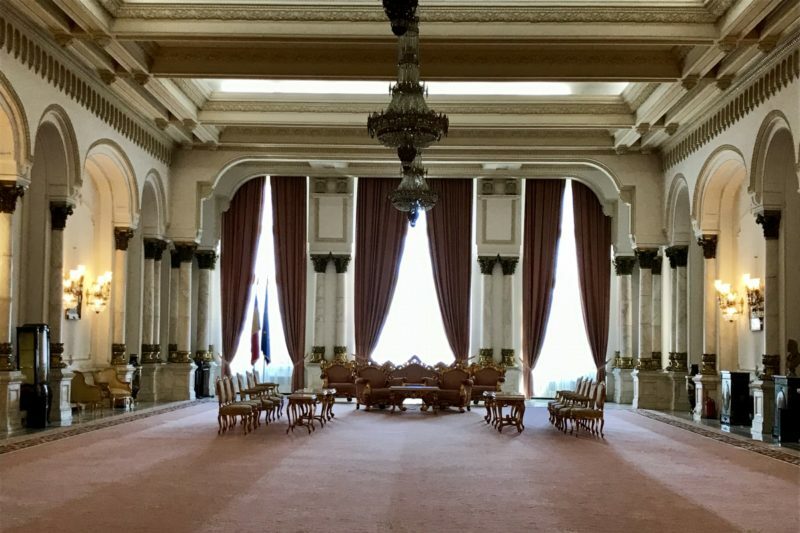 The President’s formal reception room. Only real VIP’s can enter, we all had to stand at the door and look in. Overall I really enjoyed Romania. While I didn’t know what to expect, it was such an interesting country. I would love to come back one day, and visit Brasov and Peles Castle, and spend more time in the mountains. 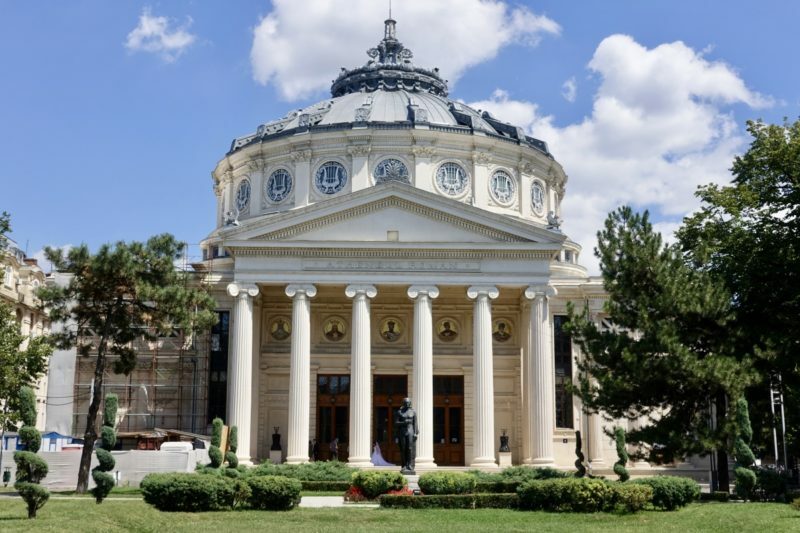 My suggestion if you visit is definitely to get out of Bucharest, as it has a very different feel to the smaller places we visited. We didn’t use any public transport within the cities we visited, and it’s probably fairly obvious that the long distance trains are slow and slightly uncomfortable – at least in summer when there seems to be no air-conditioning. 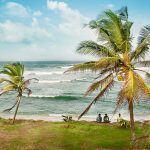 Locals said we were crazy getting the train, and that buses were so much better, so perhaps that is advice worth considering. Wifi was readily available. Every cafe/restaurant/attraction seemed to have it available. While not super speedy, it did the job. Train stations did not have wifi. Romania was really cheap. We we paying amounts like €40 for a one bedroom apartment through AirBnB, and €78 for a five star Hilton. We were easily able to eat a basic meal out for less than €10 including a beer and a glass of wine. All good value as far as I am concerned. Love the pretty buildings! Saving this for when I go to Bucharest! Thanks Chloe. 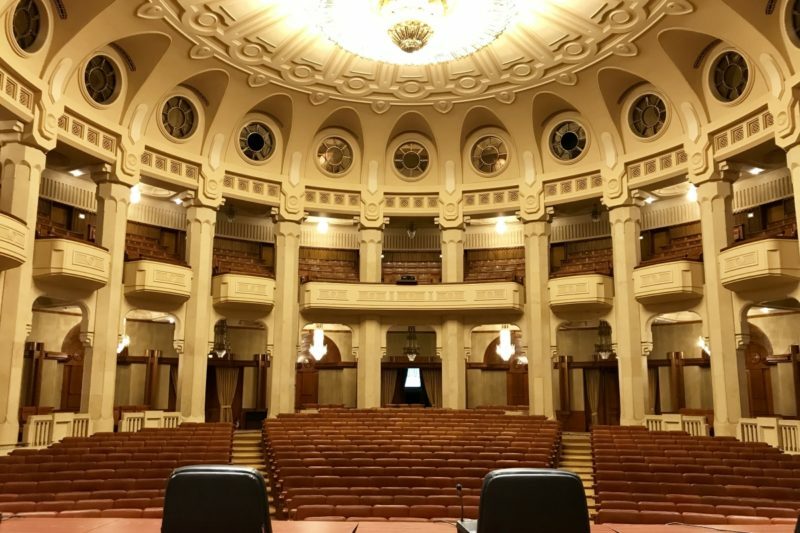 Let me know what you think of the Palace of the Parliament tour. Do you know about the german history? 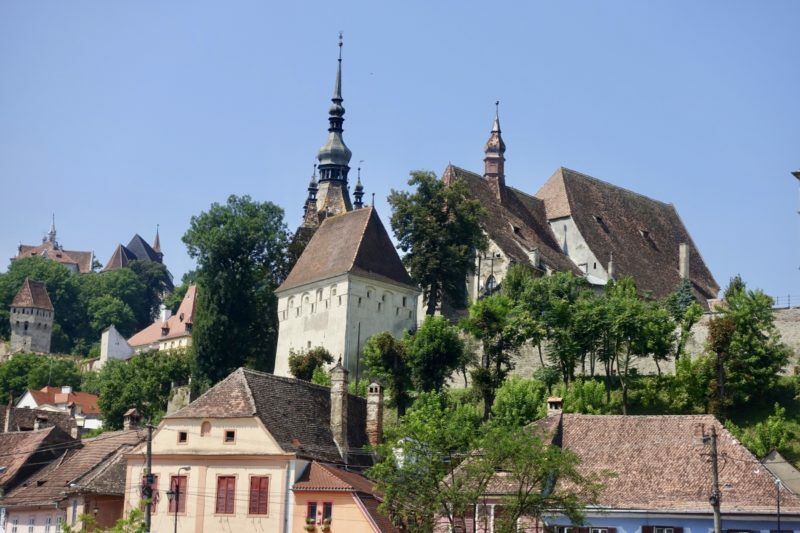 Places like Sighisoara, Sibiu, Brasov were build by germans, most of them left Romania in 1990 after the revolution. They used to live in Romania for more than 850 years. Our guide did tell us about the Germans. It is easy to see their influence on the towns compared to the other cities. Thanks Megan. 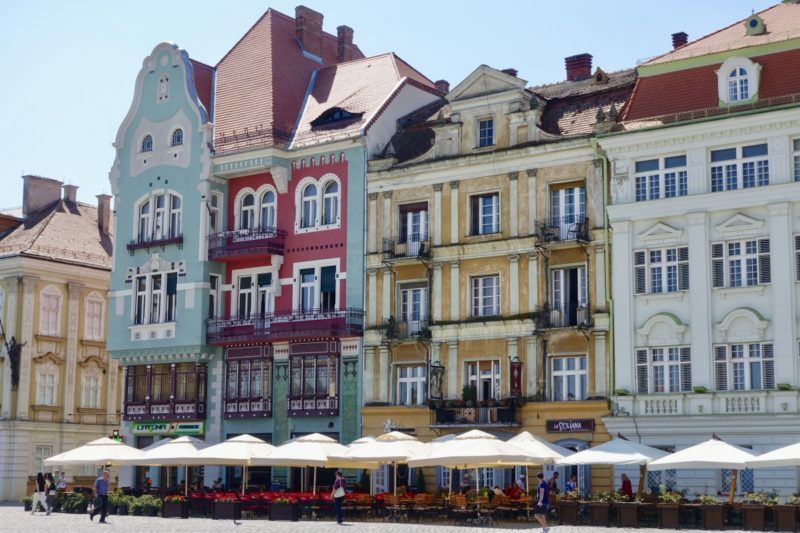 We quite liked Timisoara too. It’s hard to put my finger on it, other than to say we liked the vibe! It love to get back there in a few years to see how it looks then. Thanks Karen. I’m a but jealous you were able to spend so long there. I am sure we will be back at some stage. 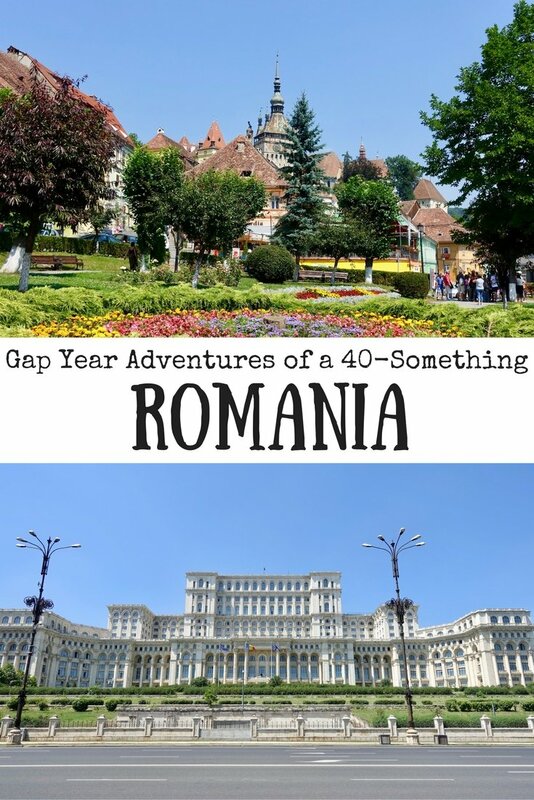 Ahh this has made me SO gutted I didn’t make it to Romania on my recent trip to Europe! Having a serious case of wanderlust right now hahaha. Thanks Danielle. 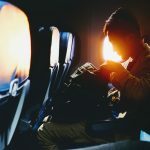 I know that feeling, happens to me every time I read about somewhere new – and half the time somewhere I’ve been too! 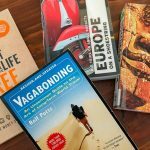 I love reading about people’s adventures when they arrive un-researched. It makes for a bit of a different holiday I think, and there’s more time to just enjoy the ambience of the place you’re visiting. 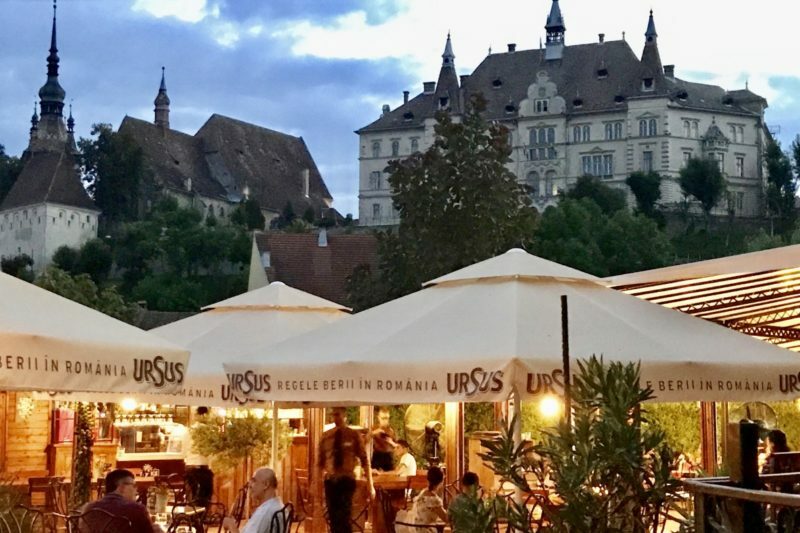 It sounds like Timisoara and Sighisoara had a ton of ambience!! It’s definitely different when it’s unplanned. Every other trip I’ve done was planned almost down to the minute, but I couldn’t possibly plan a whole year like that. It’s nice – and necessary – to have time to just chill.